Ten years after the financial crisis, the Netherlands has emerged as the 4th most competitive economy in the world. This is according to the latest World Economic Forum Global Competitiveness Index which ranks 137 economies by their ability to sustain inclusive growth. That means growth that delivers positive change and benefits citizens as well as the environment. According to the report the Netherlands is in “an excellent position to shape the unfolding Fourth Industrial Revolution”. 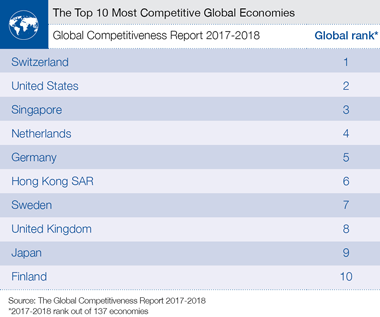 Holland is only surpassed by Switzerland (1), the US and Singapore. The index looks at 12 pillars of competitiveness including innovation, infrastructure and the macroeconomic environment. In August, the Netherlands was also ranked as the 4th most innovative country in Europe. “The Netherlands maintains its position with the support of a strong education system and high levels of tech readiness among businesses and individuals. Its thriving innovation ecosystem puts the country in an excellent position to shape the unfolding Fourth Industrial Revolution,” the report concludes.